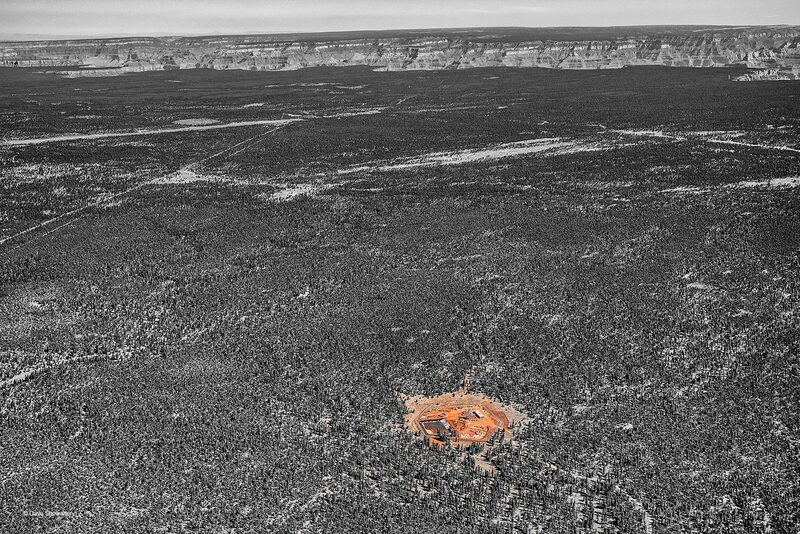 Uranium mining in the Greater Grand Canyon Region is a hotly contested issue, pitting science and concern for the Colorado River against the mining industry and political ideology. The Canyon Mine is located just 6 miles from Tusayan, near the South Rim of the Grand Canyon, across the top of the frame just a few miles further. Threats to reverse the 2012 uranium ban, the Trump administration's dismissal of ongoing science studying uranium impacts, and active threats from the Canyon Mine and others in the region put the Colorado River at risk - a river that supports 40 million people in the American West. I chose to make the image black and white, leaving the bright orange of mine, soil, and toxic water pit in color, emblematic of this hot issue about a hot mineral. Uranium mining in the Canyon and where it threatens the Colorado River Watershed is too risky. LightHawk generously provided aerial support. Photo © copyright by Dave Showalter.